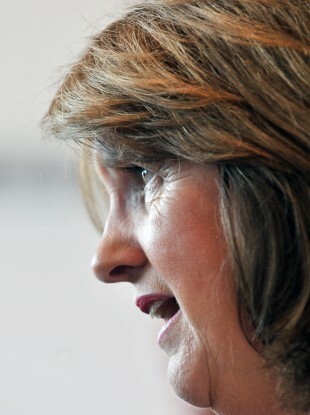 DRAFTING IRELAND’S ANNUAL budget is a “tough experience”, Minister for Social Protection Joan Burton has said – and the discussions on next year’s budget will be difficult. This will be my third budget, and it’s – put it this way – a tough experience. She said that pulling very large spends out of the Irish economy would make deflation deeper. Burton recently wrote a piece for the Guardian newspaper with László Andor, Pervenche Beres, Yves Leterme and Henri Maloose. “Basically saying that Europe as a whole, not just Ireland, has to reflate its economy and it has to get people back to work,” is how Burton put it. Europe has faced crises before, like the time of the great recession and economies recovered when people got back to work and banks began to function properly in terms of giving credit to businesses. So the budget discussions will take place against a backdrop of Europe’s dawning realisation that, hey, austerity is not the only way. “There is a rethink going on,” said Burton. So we are making progress slowly but we need a European economy where Europe itself invests in economy and if it does then that will be a really positive backdrop to Ireland recovering. In fact, we’ve tried to do what we’ve had to do in a very, very fair way. Burton pointed out that she was one of the people who strongly opposed the bank guarantee: “I just thought what we did was an incredibly expensive way to go about something that was going to be very expensive anyway”. I think we ended up costing ourselves probably twice or three times as much as it should have cost us because a bank collapse is never cheap in any country. She said the level of social welfare abuse “is relatively low” but that in a budget of €20 billion, even 3 per cent of people abusing it amounts to millions of euro. Let’s get people back to work. Let’s ensure that we protect core payments. And lets make sure that the system doesn’t allow people to abuse the system and scam it. Minister Burton had strong words to say about new jobs being created in Ireland, saying that as they arrive here, she wants “that the focus is equally on people in the live register”. One of the thing that upsets me as a minister, is that sometimes people don’t see the resource that the live register is of our fellow citizens. And if we could get more people who are on the live register taking up jobs that are being announced, well then social welfare would come into balance itself. She said that she has been very careful as a minister to do a lot of reform, and the fact this is being done on less money “is a significant achievement”. I think we’ve done and we achieved a lot of good work. However we still have a problem with the banks, we still have a problem with people who are indebted. And in terms of my own portfolio, on a weekly basis I see the figures, the 290,000 people who are not working at all, and who want to work. And that certainly inspires me to do the job with all the determination and whatever capacity I have to bring to the job. Email “"Are things tough? Yes they are" - Burton on Budget 2014”. Feedback on “"Are things tough? Yes they are" - Burton on Budget 2014”.